Changes include the introduction of some new look limited stop services to improve links from the Peterlee area to Hartlepool, Dalton Park, Spectrum Business Park and Sunderland. ​A remarkable man who is still taking monthly coach trips at the grand old age of 104, has had a National Express coach named after him. Hexham's new bus station will come into use from the start of services on Wednesday 30 November. Ahead of this, there will be changes to the times of some services and improvements to others which will come into effect on Monday 28 November. Here's your Saltwell Park Fireworks travel guide. 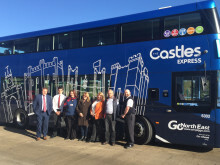 The region’s biggest bus company, Go North East, has been shortlisted for 11 top accolades in recognition of its commitment to excellence in the transport and tourism industries. Express services will be unable to stop between Gateshead Interchange and Eldon Square. We have seen our brand new website hit 1 million page views since it launched just five weeks ago – thanks to some super-useful new features. Travel guide and bus diversions for Houghton Feast. ​To enable the current major works in Gateshead Town Centre to move forward, a full closure of Gateshead High Street will take place from 9am on Monday 17 October for two weeks. ToonLink services 12 and 12A will be on diversion. A story about an act of kindness by a Go North East bus driver has gone viral after over 14,000 people liked and shared it on social media site, Facebook. Starting on Monday 3 October 2016, Durham County Council will close North Road below the bus station exit and part of Milburngate. Services 21 and 50/50A will be diverted. 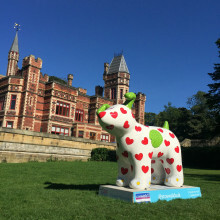 The region’s biggest bus company, Go North East, is putting its full support behind a charitable-initiative led by regional hospice St Oswald’s, by placing a dog designed by British actress, Joanna Lumley on its Great North Snowdogs trail. Kynren, an epic theatre production which opened in July and includes 15 performances in County Durham, has commended Go North East’s support, providing park and ride services for the show’s thousands of weekly visitors.